On the way up Southampton Water, you'll pass Hythe - location of the oldest operating pier train in the world. There are great views of all the large liners from here. Along one of the ten longest piers in the British Isles runs the oldest operating pier train in the world. The electric locomotives that do all the work (built in 1917) were originally commissioned for operation in a mustard gas factory during the First World War. During the course of the evening of 1 November 2003 the dredger Donald Redford, commanded by the inebriated Junior Master, motored straight through the middle of pier. Repairs costing £308,000 were eventually carried out and the pier reopened on 7 January 2004. One of Hythe's most famous residents was El Aurens; a.k.a: T.E. Lawrence; a.k.a: AKA Lawrence of Arabia. During World War II, Hythe was used as a port for the “little ships” of the Royal Navy, the Motor Torpedo Boats and the RAF Air/Sea Rescue Boat. At the heart of the New Forest Waterside is Hythe, a busy shopping centre steeped in maritime history, both ancient and modern. It has witnessed the maiden voyages of majestic liners from the Titanic in 1912 and the Queen Elizabeth in the thirties to the QE2, Queen Mary 2, and more recently the Queen Victoria and Aurora. The unique electric train that runs along Hythe pier is listed in the Guinness Book of Records as the oldest working pier train in the world and no trip to Hythe is complete without a ride to the pier head to enjoy the dramatic view, or take a short ferry trip to nearby Southampton. Visit the World's Oldest Pier Train. Construction of the Hythe Pier was started in October 1879. It was opened with considerable ceremony on 1st January 1881. At 2,100 feet (640 metres), this nineteenth century iron pier is one of the ten longest piers in the British Isles. In 1909 tracks were laid for use by hand-propelled trolleys to carry goods and luggage. In 1922 a narrow gauge electric railway opened to take passengers the full length of the Pier. This railway with its original engine and rolling stock is still operational today and an important part of the local transport system to Southampton. 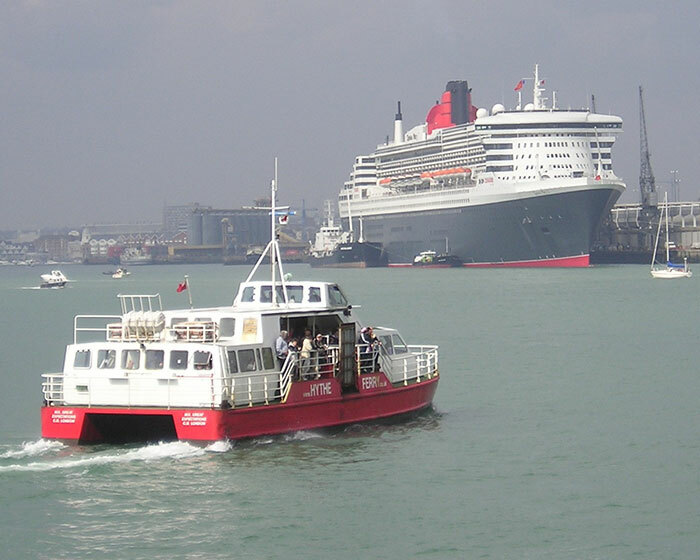 A trip on the Hythe Ferry is probably one of the best views of the Queen Mary 2 & Queen Victoria when in their Southampton home berth, as the Hythe Ferry sails right past their berth. Frost Lane Farm - not a farm at all, but known as such by the locals - Barry's Sanctuary is field containing donkeys, geese, pot-bellied pigs and chickens. 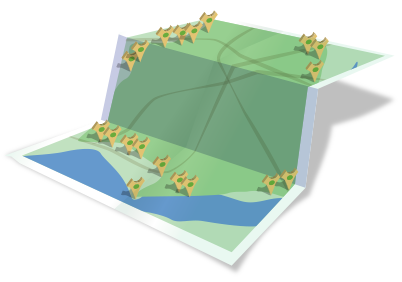 A Hyth in Old English was a hard, permanent, landing place on a river or sheltered estuary and the position of Hythe clearly fits that description. The first recorded use of the name dates from 1293. The villagers of Hythe were occupied in a mixture of agriculture, fishing and ferrying. During the Middle Ages the size of vessels visiting Southampton increased to such an extent that they could not land their cargoes directly onto the quays. They anchored in the river and the boatmen of Hythe acted as lightermen, transferring the goods from ship to quay. The first mention of a regular ferry occurs when the name Hitheferye appears on Saxton's map of Hampshire in 1575, though clearly the passage had probably been manned since the village was founded. By the late 1750s Hythe already had a thriving shipbuilding yard run by George Wadmore. Positioned on the southern edge of the village in what is now Shore Road it had good access to Southampton Water and had a dry dock as well as several slipways. The shipyard continued in various ownership's until it was bought in 1927 by Hubert Scott-Paine. After a major reconstruction of the yard he founded a company for the construction of a revolutionary design of power boats. The British Power Boat Company as it was known built initially for the private market but the designs were soon taken up by all three armed services. Hythe became the home of the "little ships" of the Royal Navy, the Motor Torpedo Boats and the RAF Air/Sea Rescue Boats of World War II. With conclusion of the War there was no need for further military vessels to be built and with no civilian market at that time the yard was forced to close, thus bringing to an end over two hundred years of shipbuilding on the site. Until 1823 Anglican worshippers in Hythe had to travel to the mother church of the Parish in Fawley or to the church in Dibden. In that year a small chapel was built to serve the local congregation. Accessed from St. John's Street, it was initially manned by a curate with Hythe not becoming a parish in its own right until 1841. The chapel was really too small for the whole of the new parish and at the first opportunity a new church was built to the rear of the old chapel but now facing into New Road. Consecrated in 1874, the church still provides an impressive backdrop as you enter the village from the south.